I've forgotten where this info came from. Sorry! Edited by yours truly (contact me). The image came from Elwin "Blaine" Coldiron. A bright light in the sky, then a crash catches Tenchi Masaki's attention one autumn day. When he gets to the crash site, he finds Ryoko, a space pirate who's on the run from a ditzy Galaxy Police woman. 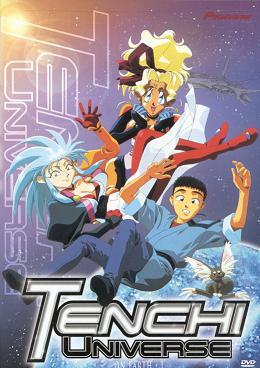 What happens next turns Tenchi's life upside-down as more beauties from the stars, as well as a mad genius buried in the cave near the family shrine, show up on his doorstep. This TV series, which differs greatly from the OVA series, follows the Masaki clan as they run afoul with a beautful bounty hunter, then the whole Galaxy Police and Jurai navy as they head into one big adventure for in which Tenchi finds his ultimate destiny.